Our South Africa tour—which also includes a slice of neighboring Botswana—begins on arrival in Johannesburg, where we gather for a welcome dinner with our Expedition Leader. An orientation this evening provides a preview of the many wildlife adventures that lie ahead on this exclusive safari itinerary. Fly and then drive to the private Mashatu Game Reserve just over the border on the far-eastern edge of Botswana. Mashatu, meaning “Land of Giants,” takes its name from the huge Mashatu trees that dominate these environs, as well as the big animals that roam its terrain. The Limpopo River, which Rudyard Kipling made famous in his Just-So Stories, crosses into South Africa near here. More than 700 elephants live on the reserve, the largest single population on privately owned land in Africa, as well as impressive numbers of lion and cheetah. Along the river, Mashatu trees provide shade for wildebeest, giraffe, zebra and eland, while at night, bat-eared fox, honey badger, African wild cat and leopard search for prey. We explore this unspoiled wilderness on exciting game drives, discovering Mashatu's ecological diversity as we traverse savanna, forest, marshland and sandstone outcrops. And at the end of each day, we stay in the center of it all at Mashatu Tent Camp, an intimate accommodation offering unexpected amenities in such a remote and secluded locale. After a last wildlife drive in Mashatu this morning, fly by chartered plane to the private 56,800-acre Manyeleti Game Reserve. Manyeleti means “place of the stars” in the local Shangaan language, and we'll surely see a sky full of them at night, given how far removed we are in the wild bush. Manyeleti shares an unfenced boundary with the eastern side of Kruger National Park as well as the Sabi Sand and Timbavati game reserves, and the region's renowned wildlife roams free between the park and reserves. This remains a relatively quiet and unknown corner of South Africa that is inaccessible to day visitors, and we reap the advantages of that exclusive access. Our destination, Tintswalo Safari Lodge, is a luxury camp in a private sector of the Greater Kruger ecosystem, one of the last tracts of true wilderness left in South Africa. This is prime Big Five country, where lion, rhino, Cape buffalo and elephant are spotted regularly, with very good chances to see the more elusive leopard, too. More than 300 bird species also inhabit the area. Explore by 4x4 and on foot, with guided walks offering a more intimate vantage point on the smaller things, like plants and insects—plus the thrill of encountering wildlife at close range. This morning we travel about 2-1/2 hours by road to the Sabi Sand, South Africa’s premier safari destination. 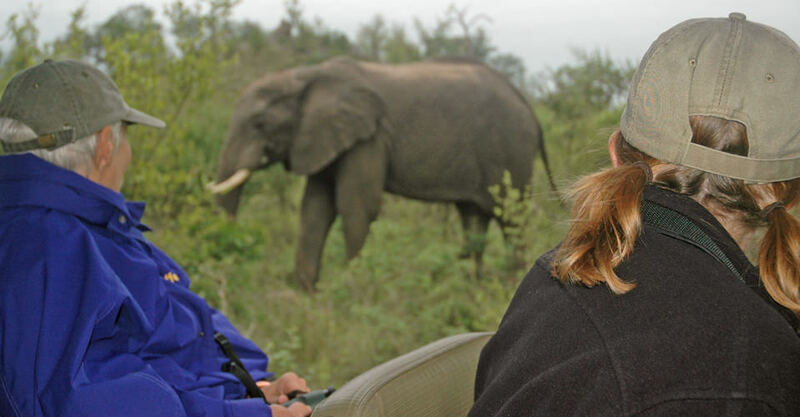 This celebrated region is renowned for some of the best Big Five viewing in Africa. These famous five—lion, leopard, rhinoceros, elephant and Cape buffalo—were once favorite hunting targets, and while many were hunted nearly to extinction, reserves like this one have made inspiring strides in bringing them back. Enjoy the exclusivity of MalaMala Main Camp, located on South Africa’s oldest and most historic private game reserve in the Sabi Sand region, having been the first to transition from hunting to wildlife-viewing safaris. 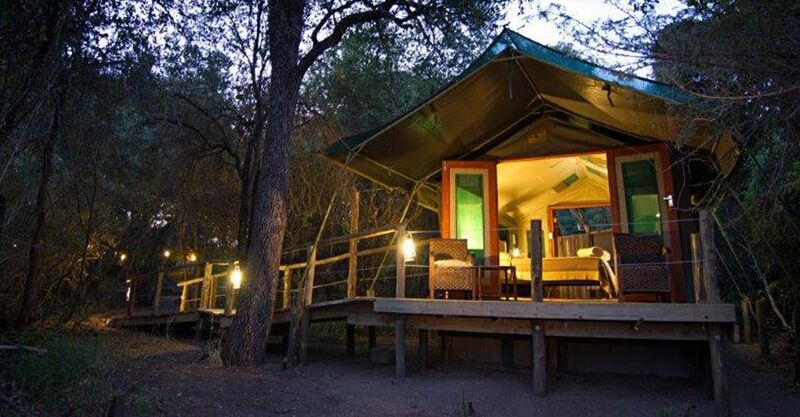 Situated along the Sand River, the camp regularly sees wildlife wandering in to drink freely. MalaMala shares a 12-mile unfenced border with world-renowned Kruger National Park and lies strategically sandwiched between the park and the private Sabi Sand Game Reserve. MalaMala is famous for its leopard viewing, and night drives are a highlight here, with an array of nocturnal species on view, including predators on the hunt. MalaMala is the largest private Big Five game reserve in South Africa, and safari tourism here directly supports neighboring communities. After breakfast and a morning activity, fly back to Johannesburg early this afternoon to connect with onward flights or extensions. Click here to view the seasonal variations of weather and wildlife viewing in Botswana.